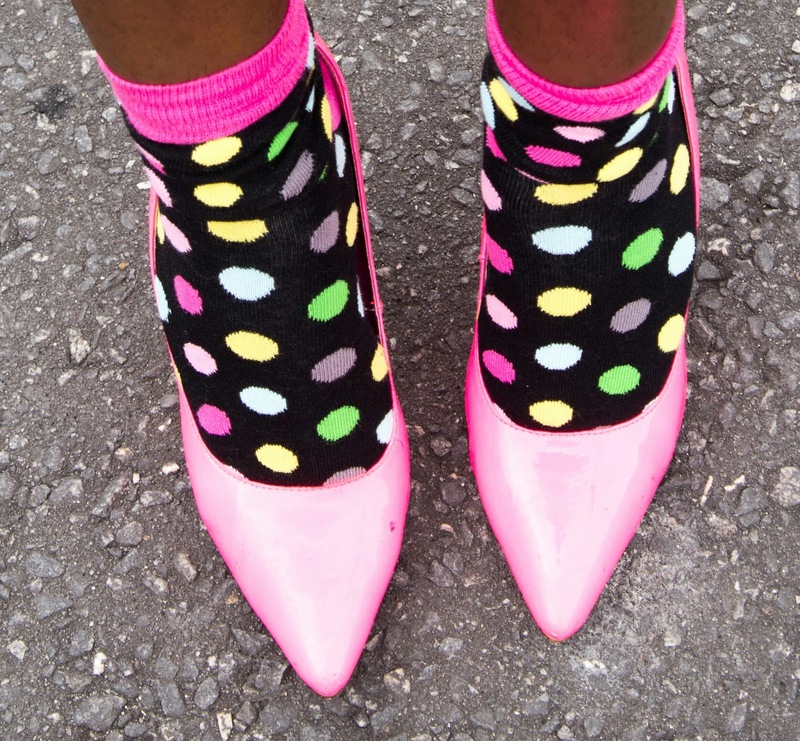 CHECHESMITHNATION : Styling Affords You Room For That Endless Creativity: What Cheche Wore! Styling Affords You Room For That Endless Creativity: What Cheche Wore! Forget fashion, styling is fun. Actually it's so interesting that it provides you the room to just birth unending creativity. However, even with ideas, natural know-how, acquired knowledge and all what nots, I' ve come to understand that people with lesser passion, could actually lose interest in styling due to a number of reasons; from societal perception to stereotypes etc. 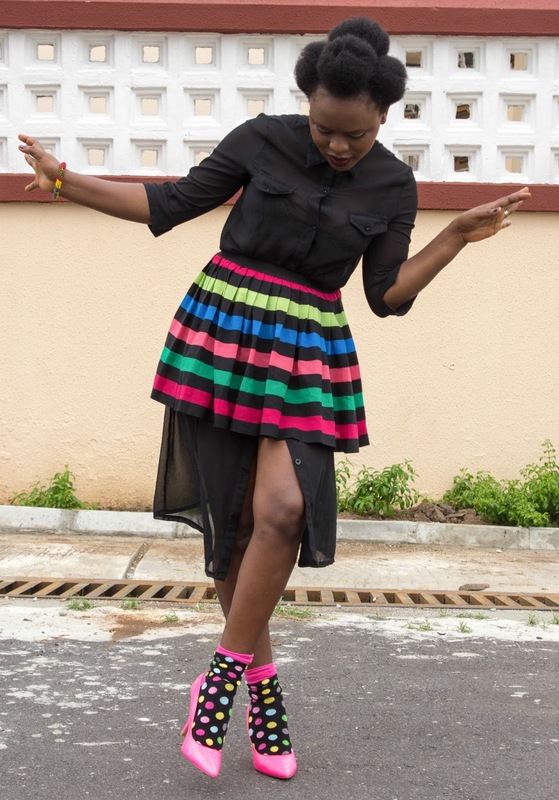 For anyone out here looking for that wardrobe essential, something cute, versatile and fun, I would like to tell you earnestly that it's called a "Skater Skirt". Yassah! A skater skirt is a must have for any stylish personality. Way back, one would be expected to pair the skater skirt with a bomber jacket, a tank too, or a tucked in shirt...well, that would be you doing just the basic. lol. 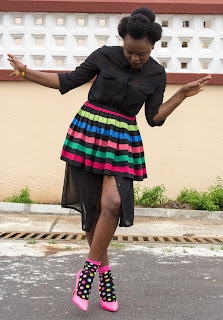 Skater skirts are vibrant, smart, alive , fun, so easy to rock and will definitely allow you flaunt those "hawt" legs too. 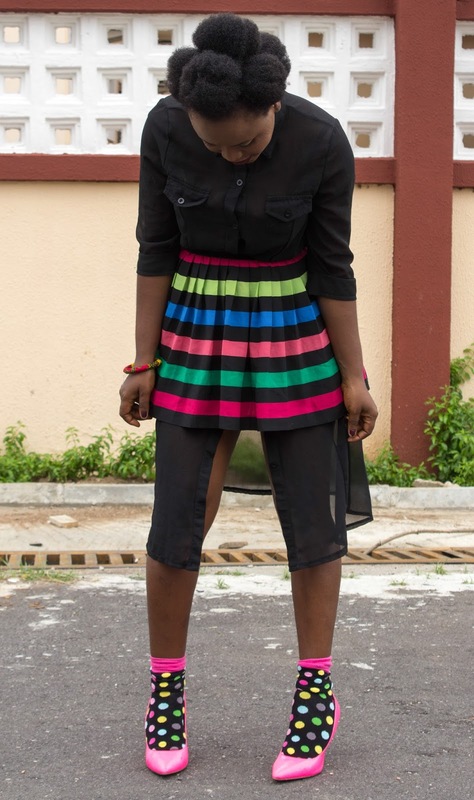 Note: with a skater skirt, one can easily go from casual, chic, trendy as long as you can switch on your style game. Now about my look...I got this inspiration from Style Temple, and voila, it registered! My style is what I call a total "burst of colours". First, I wore my chiffon buttoned-up jacket, then I went way edgy by pairing my colourful pleated skater skirt right on top of my jacket...but you know Cheche will always spice up her looks right?...so I topped it all up with my vibrant pink pumps and of course pair of stockings from All socks (@allsocks_). Black chiffon jacket, skater skirt, pumps from Cheche Smith Nation. Sweetheart, you look fabulous. Words alone cannot describe how stylishly beautiful you are....your creativity is a unique one and I can't stop falling in love with your colours. Keep on looking fabulous dear.